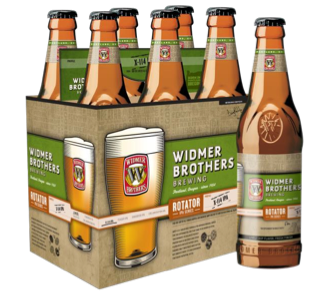 You may be aware that Widmer recently released two gluten-free beers...a pale ale and a lager. This actually happened locally back in March. Omission is the brand name. They had a release party somewhere. I'm not exactly sure where. 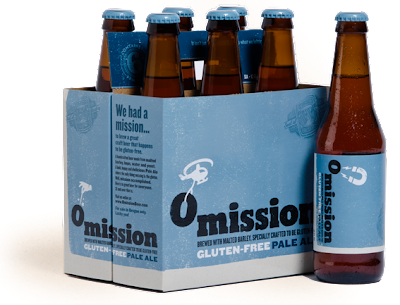 They announced today that they will be rolling the gluten-free beers out nationally in the next month or so. Sometimes it truly does pay to have the Anheuser-Busch distribution network in your back pocket. These are going to be the first nationally distributed gluten-free beers. Hold that thought. When I first saw the Omission packaging, I was perplexed. Nothing about it told me this was a Widmer beer. There's a small, screened Widmer logo on the packaging and label. If you compare this to the standard packaging, it's pretty clear they wanted to differentiate the Omission beers. They haven't commented on the branding issue to my knowledge. I initially thought perhaps they wanted to sequester the Omission beers in case they bombed. Why damage your brand with a product that is, for whatever reason, not well-received? Obviously, they did not bomb. With revelations of a national release, I now realize protecting their brand wasn't what they were up to. Nope. With national release of the Omission beers, Widmer is essentially creating an entirely new category. Just as Miller did when it launched Miller Lite in the 1970s...to dramatic success. I'm sure they've done their homework down on Russell Street. There's a growing demand for gluten-free beer on the part of people who are gluten intolerant or have other health issues. And let's not forget the folks who will drink this stuff simply because they feel it is healthier than standard issue beer. With essentially no competition out there at the national level, Widmer is going after this market. You can bet there will be more beers in this category once the initial two gain acceptance. The most obvious choice is an IPA, which would capitalize on the popularity of the style. Others could follow. Like I said, they aren't saying much about any kind of master plan. But looking at the declining popularity of Widmer's core Hefeweizen in recent years, it make sense that they would be looking to take advantage of a significant emerging opportunity. This could prove to be an ingenious move. Is Craft Beer Leaving the Brewpub Model Behind?